How to Clean a Flat Iron. 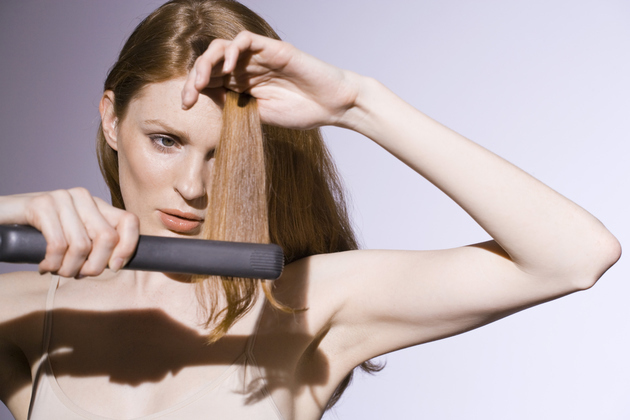 Do you use a flat iron to straighten your hair? In time, hair products can cake up on the flat iron plates. This build-up will reduce your flat iron's performance and can damage your hair, causing breakage and split ends. To prevent this, you should clean flat iron plates regularly. Don't worry, it's easier than you may think. Check out our easy tips for cleaning flat iron plates. 1. Unplug the flat iron immediately after use. Let it cool down on a heat-resistant surface until it's still slightly warm, but easy to handle. 2. Dampen a soft cloth with water. 3. Gently run the damp cloth over the plates, wherever you can see baked-on grime. Be wary of burning your hands. 4. If you notice remaining residue, spray iron cleaner onto the plates and wipe them clean with a clean, soft cloth. You can also use a soft cloth moistened with alcohol. 5. Repeat step 3. It may take several cleanings to remove severe build-up. 6. Use a damp cotton swab to clean grime in tight spots. 7. Run a clean damp cloth over the rest of the wand. 8. Let the flat iron dry thoroughly before you use it again. How Often Should You Clean Flat Iron Plates? This will depend on how extensively you use the flat iron and the styling products you use. If you go several times a day over every strand, you may need to clean flat iron plates 3 or 4 times a week. If you’re just using it to straighten your bangs, you can clean flat iron plates once a week. Keep an eye on your tools and you'll learn to spot forming build-up. 1. Flat iron plates are made from a variety of materials. Before using any cleaning product, make sure it is safe to use on the respective material. 2. Clean flat iron plates with a damp cloth after every use for daily maintenance. This will reduce build-up and make the more extensive cleaning process a piece of cake. 3. You should never run water on a flat iron as it can cause permanent damage. 4. If there is any residue left on the flat iron plates after cleaning, you may notice minor odor/smoking when you turn the iron on again. Do not be alarmed, this is a normal occurrence and should dissipate within a few minutes. 5. If you are worried about burning your hands, the iron can be cleaned while cold. You can also wear an oven mitt while cleaning flat iron plates.